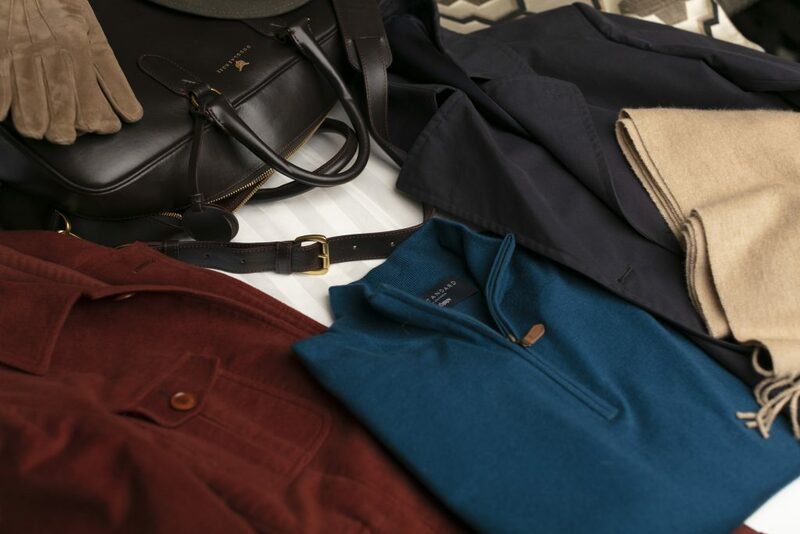 One of the most important and often misunderstood aspects of dressing for winter weather is the custom or practice of layering. Europeans are recognized expert layer stylists but Americans often struggle with this predominately cold weather custom. In other words, whatever you wear on the inner layer should be something you feel comfortable wearing as a standalone. Don’t wear a torn dress shirt or damaged sweater thinking that your jacket will hide the unseemly parts. The whole point of layering is to be able to adjust your level of warmth based on your environment. Inside you may want to remove your jacket and sweater while outside you may need the overcoat and scarf and gloves. Layer from the inside out and from lighter to bolder or vice versa. Keep a harmonious flow to your outfit with a graduated look. If you start with a patterned or plaid shirt, wear a solid sweater and a neutral toned jacket. Or try a solid colored men’s dress shirt with a checked or patterned sweater, a solid jacket and a glen plaid overcoat. Layers add insulation and warmth but you also want the fabrics to breathe so that you don’t feel stifled or overheated. Cotton is a great first layer as it breathes and keeps moisture at bay. A second layer of worsted wool, knit or flannel in the form of a vest or pull over adds warmth. Keep in mind this layer should not be too tight or constricting. For instance, wear a sleeveless vest to add warmth and comfort without adding bulk to your sleeves and shoulders. Visit a Knot Standard showroom in New York City, Washington DC, Dallas, Austin, Los Angeles or Dubai to buy a custom made Sojrn cashmere sweater. A third layer can be comprised of your suit jacket or blazer. This is for the office, an everyday look that can be dressed down by simply removing your jacket. Don’t forget the tie and pocket square. Try the Madison Chocolate Flannel Suit for a versatile flannel wool that will keep you warm and stylish. Made from high quality Vitale Barberis Canonico fabric, the Madison Chocolate is the perfect layering suit as the flannel acts as an insulator over a cotton men’s dress shirt and layered vest and the half canvassed jacket allows plenty of room and comfort for wearing with an overcoat. For the final layer, choose a durable and workhorse overcoat that is versatile and will work with many different outfits. Order one of our most popular statement pieces, the Classic Beige Glen plaid Overcoat. A stunning large glen plaid design in wool and cashmere, this overcoat is a show stopper that works great with layered looks. Don’t forget the pièce de résistance, a Classic Camel Colored Alpaca Scarf to keep you looking stylish and dapper while bundled up.